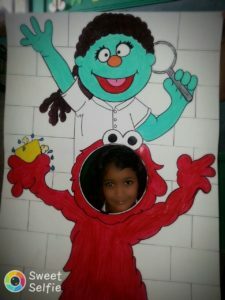 In response to the more than 1,600 children who die each day from diarrhea caused by unsafe water and poor sanitation and hygiene practices, Sesame Workshop announced its goal to “protect children around the globe from illness caused by dirty water and poor sanitation.” Sesame Workshop has joined forces with World Vision to address this global health crisis. 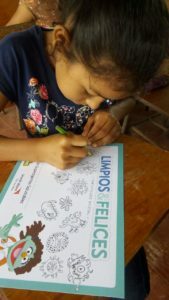 World Vision Honduras (WVH) has partnered with Pure Water for the World (PWW) to deliver the new Sesame Workshop WASH education programs to classrooms in Honduras. 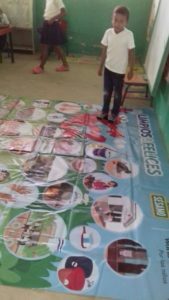 WVH is implementing the “Limpios y Felices” program in 14 education centers in the communities of San Matías, Jacaleapa, and Danlí. PWW is implementing the program in two schools in Trojes, Escuela Froilán Turcios de Cayantu 1 and Nelson Rene Moncada. The interactive program uses games, stories, videos, dynamics and songs to make WASH (water, sanitation and hygiene) engaging and fun for the kids. The launch of the program was a huge success, with teachers and students decorating and having lots of fun interacting with the Sesame Street materials. The program is already being very well received and has good momentum among the teachers, students and parents. “This program will complement the work our WASH training and consulting team is already doing in Honduras, providing teachers with ways to integrate WASH topics into their existing school curriculum. Now we have these materials to further support our training efforts,” shares Maria Inestroza, PWW Honduras Country Director. The pilot program is taking place in 30 communities in Honduras this year, with the anticipation of ramping up to 100 communities in 2018. In the following video, Maria presents the WASH UP! program materials to Heydi Zepeda, principal at Escuela Froilán Turcios de Cayantu 1. The children of Escuela Froilán Turcios de Cayantu 1 share a word of thanks for bringing the Sesame Street Project to their school. Watch an interview with Maria and Caesar, a team member with World Vision Honduras, talking about the program in Honduras. WASH Success Stories #WASH training, Honduras, SesameStreet, WASH, WASH in schools, WASH UP, WorldVision. permalink.